Here are flat, pale tan, spreading vegetations over the mitral valve surface and even on the chordae tendineae. This patient has systemic lupus erythematosus. Thus, these vegetations that can be on any valve or even on endocardial surfaces are consistent with Libman-Sacks endocarditis. These vegetations appear in about 4% of SLE patients and rarely cause problems because they are not large and rarely embolize. 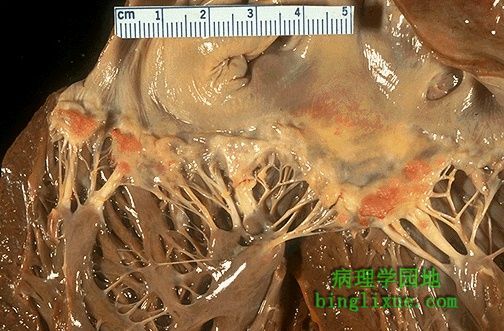 Note also the thickened, shortened, and fused chordae tendineae that represent remote rheumatic heart disease.